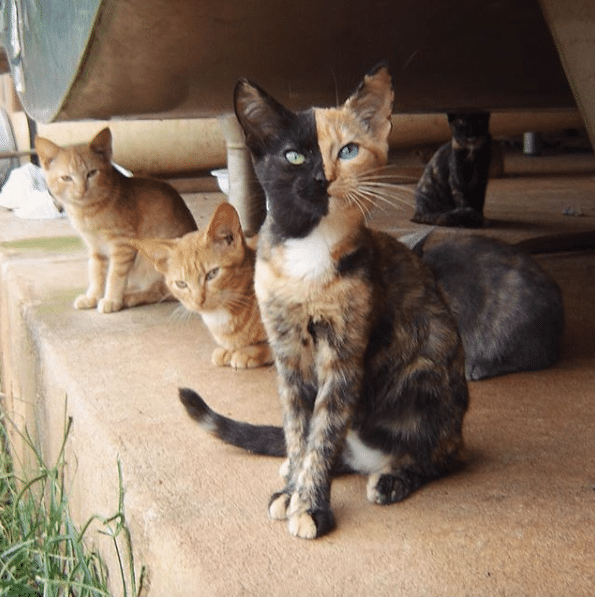 Ever heard of a two faced cat? If not, then you have to believe this story about Venus, the cat. 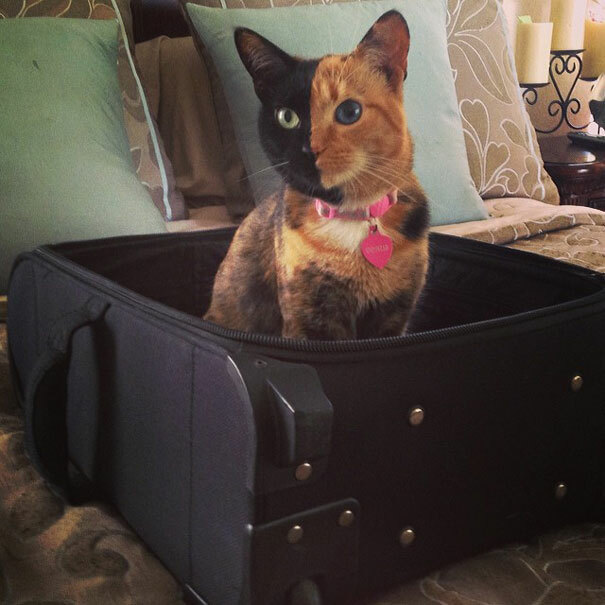 Venus is a two faced cat and no, the image is not photoshopped like most people believe it to be, can’t blame them. Technology has made it possible to create images for sensational news that has the tendency to become viral on the various social media sites. But, in case of Venus, you can be assured that this feline is not a photoshopped cat just for the sake of publicity. 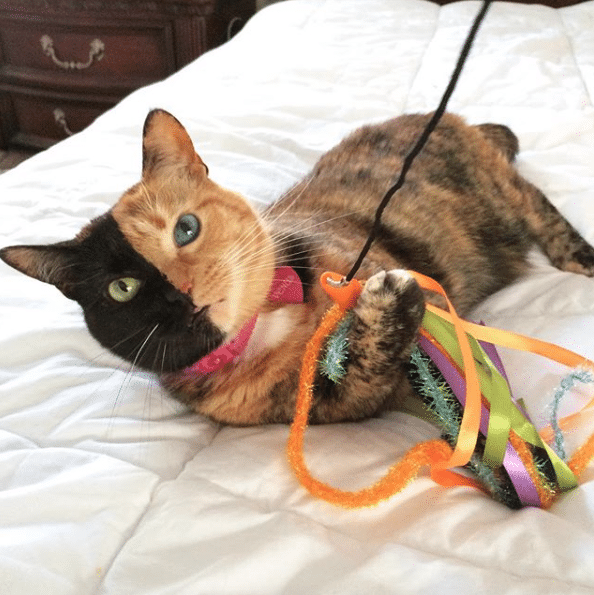 Venus is an adorable two faced feline with the “coolest cat ever” tag. Venus the cat is 8 years now and has been adopted by Christina a cat lover. 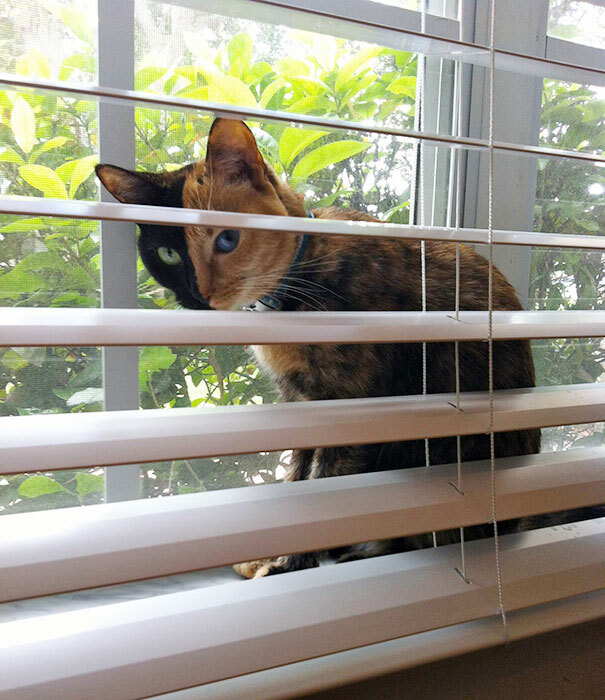 Venus the cat is so popular that this feline has a facebook page of her own. 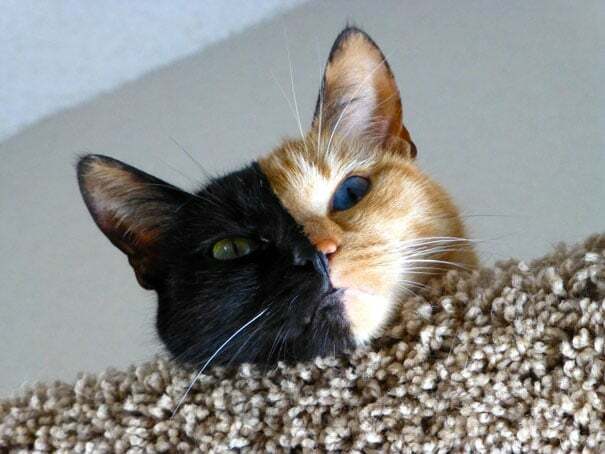 One look at this cat and you will notice that one half is solid black with green colored eyes, while the other half has typical orange tabby stripes with blue colored eyes. It’s a mystery that many people are not able to understand how a cat can be born like that. A unique phenomenon found in cats. Venus was actually found at a dairy farm in North Carolina in 2009, September and was adopted a few years ago. According to her owner, Venus is a sweet, loving and gentle cat. She still has that cute “meow” of a kitten even though she is a full-grown cat now. She loves to be cuddled like a baby, but behaves like a grown-up. Venus the cat is careful of not spoiling the furniture. Instead, she uses the scratching post and she doesn’t have any bad habits according to her owner, making her the coolest cat ever. Why is Venus the cat born this way? Many reports about Venus have referred to Venus as a “chimera”. In mythology a chimera is a mishmash monster that is made up of different animal parts. 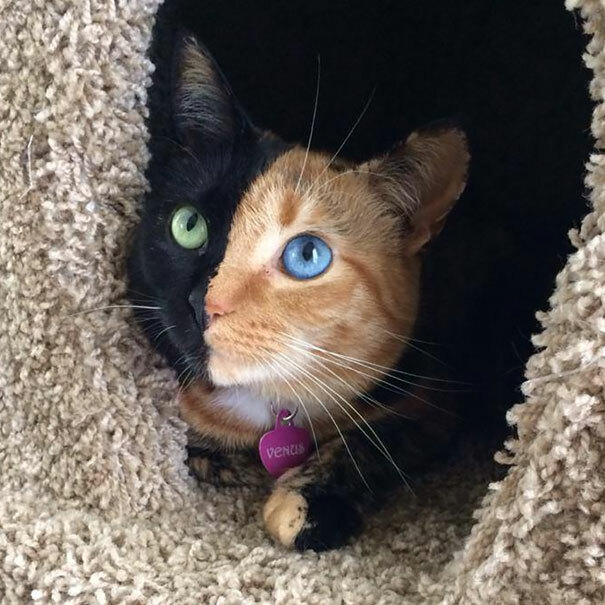 A feline chimera is a cat whose cells contain two types of DNA, which is caused by two embryos fusing together. According to Professor Leslie Lyons of University of California, she has not seen a cat like Venus. She studies the genes of domestic cats at the University. Lyons said among felines chimeras are not all that rare. 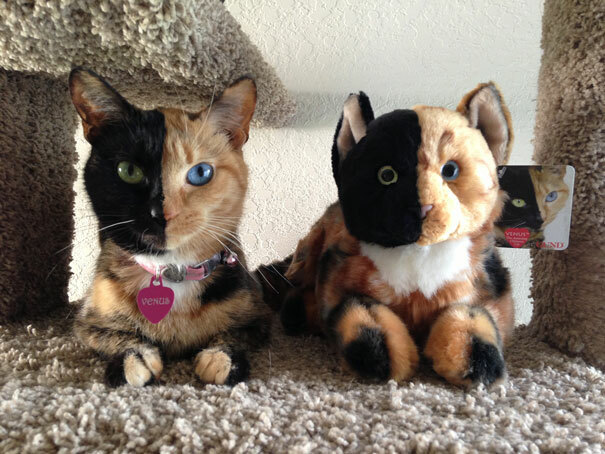 The fact remains that all male tortoiseshell cats are chimeras. 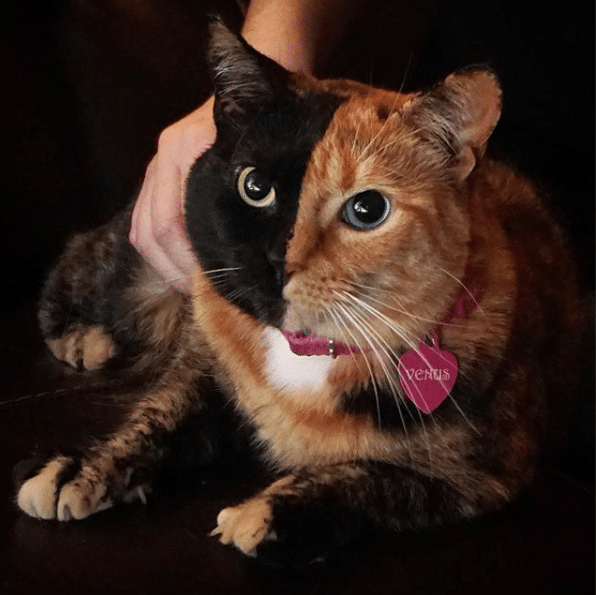 The distinctive orange and black cat is a clear sign that this cat has an extra X chromosome. But, according to Lyons, female cats have two X chromosomes so they can have the coat without the extra X. This is why she believes that Venus can’t be a Chimera. To get to the root of the issue, you will have to do genetic testing. With skin samples from each side of the cat, DNA fingerprint can be done. DNA from one side should not match the other side. The question that has always intrigued people is that if Venus is not a Chimera, then the mystery about her unique face need to be solved. According to one theory by Lyons, the black coloration may be activated randomly in all the cells on one side of her face, while the orange color might have activated on the other side of the face and these two patches might have met at the centre of her body as she was developing. Cat fanciers are surprised by the split face, but Venus has a single blue eye, which is not common in cats. 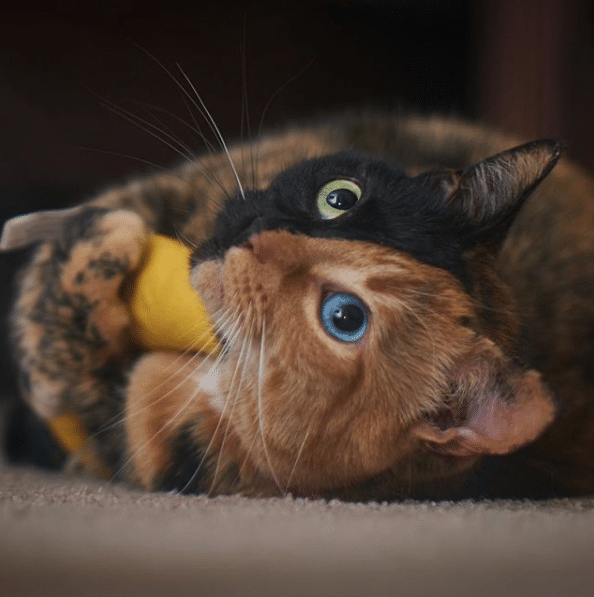 Cats have either yellow or green eyes and not blue. According to Lyon, blue-eyed cats are usually Siamese or a cat with a lot of white spotting gene on them that affects their eyes. The white spotting gene or the piebald gene is differently affecting the two eyes. There is definitely a lack of pigment in one eye. 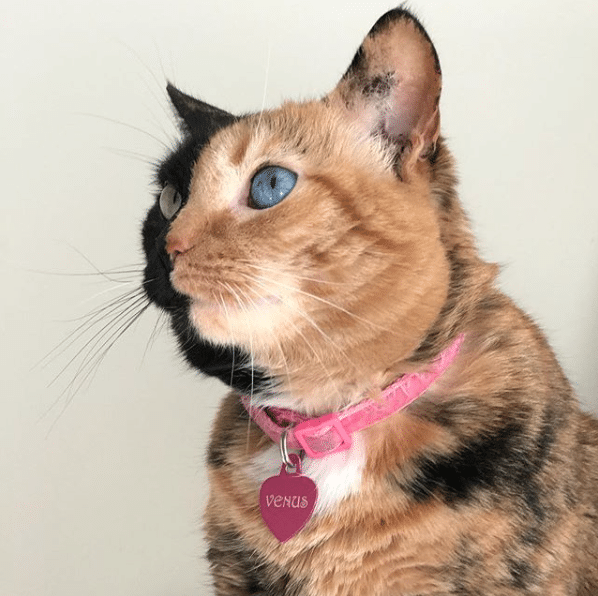 Venus the two faced cat is a mystery because she appears to have a white patch on her chest only, which is not a good enough reason to explain her blue eyes according to Lyon. With a million likes on her Facebook page and half a million followers on instagram, Venus the cat is definitely an internet sensation. Venus got her stardom only when her picture was posted on Reddit and went viral. Venus inspires people because she is different and sends a strong message that we all are different and not meant to be born same. According to Christina who has adopted Venus and taken the Venus story to celebrate differences in people, has received a lot of messages from parents and kids with vitiligo, cleft palates, port-wine stain birthmarks and various other conditions who are a target of bullies and ridicules. Christina says because Venus is born different, she is famous because of her unusual looks. Venus has set a standard where being different is cool. A lot of people have looked up to Venus and have accepted their different and abnormal uniqueness as a positive and cool feature. The story and popularity of Venus has touched the lives of many. Christina says, Venus loves her treats and her favorite pastime is snuggling. Venus is a lap cat in all sense and will occupy anybody’s lap if Christina is not available. Christina also has another cat called Roo and Venus is very much close to Roo. Venus is also fond of climbing trees, playing with cat game apps and playing with feather toys. Watching and listening to wildlife is her another favorite hobby. There are plans to start a product line of Venus merchandise on popular demand of her fans very soon. Venus the cat is lucky to get adopted, but there are many out there who need care and attention. 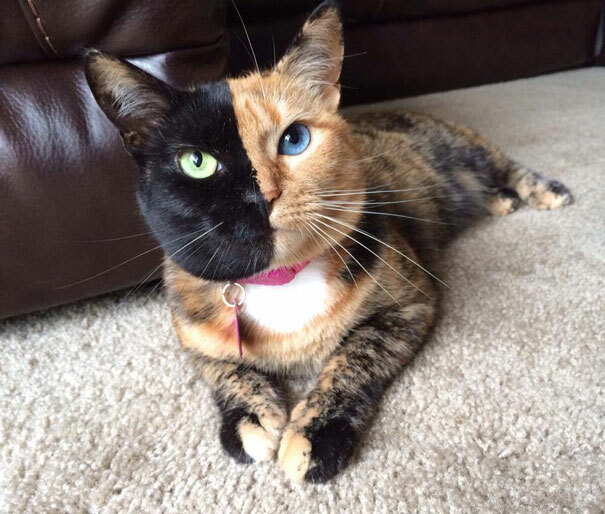 This adorable two faced cat has brought a lot of positivity in many lives and is still an inspiration for many.